Quantitative approaches to assess the complexity of groundwater drought are hindered by the lack of direct observations of groundwater over space and time. Here, we present an approach to evaluate groundwater drought occurrence based on observations from NASA's Gravity Recovery and Climate Experiment (GRACE) satellite mission. Normalized GRACE-derived groundwater storage deviations are shown to quantify groundwater storage deficits during the GRACE record, which we define as the GRACE Groundwater Drought Index (GGDI). As a case study, GGDI is applied over the Central Valley of California, a regional aquifer undergoing intensive human activities and subject to significant drought periods during the GRACE record. 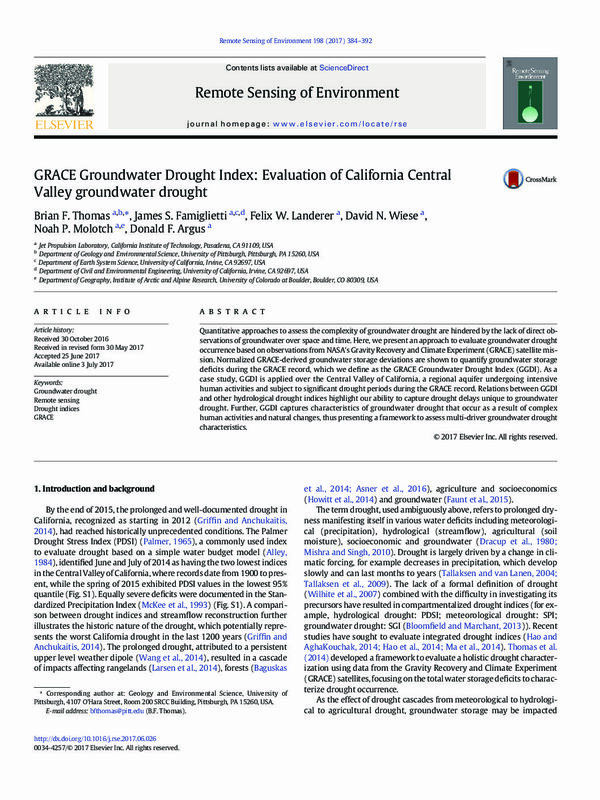 Relations between GGDI and other hydrological drought indices highlight our ability to capture drought delays unique to groundwater drought. 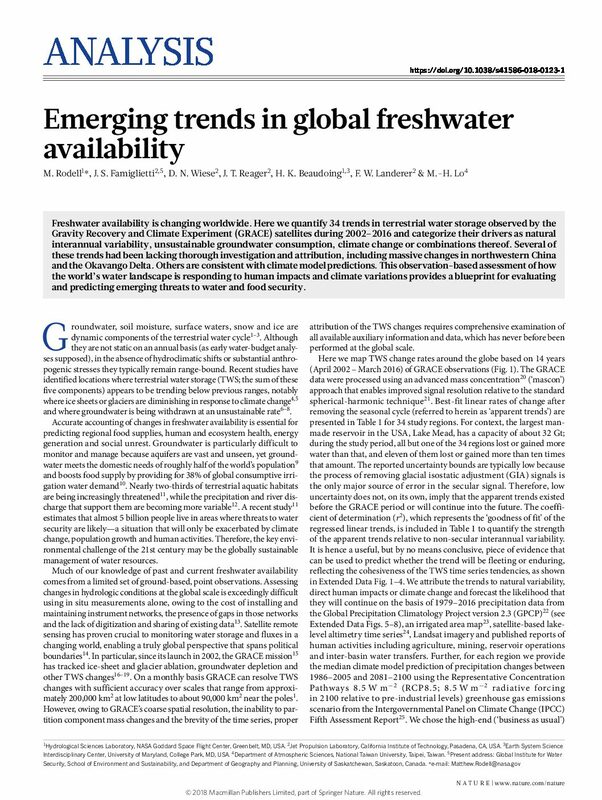 Further, GGDI captures characteristics of groundwater drought that occur as a result of complex human activities and natural changes, thus presenting a framework to assess multi-driver groundwater drought characteristics. Contemporary applications of radar altimetry include sea-level rise, ocean circulation, marine gravity, and icesheet elevation change. 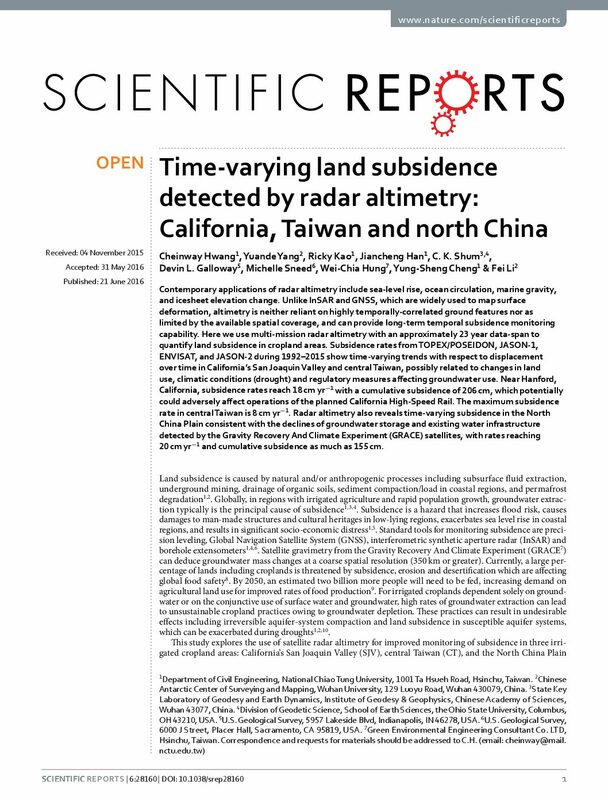 Unlike InSAR and GNSS, which are widely used to map surface deformation, altimetry is neither reliant on highly temporally-correlated ground features nor as limited by the available spatial coverage, and can provide long-term temporal subsidence monitoring capability. Here we use multi-mission radar altimetry with an approximately 23 year data-span to quantify land subsidence in cropland areas. Subsidence rates from TOPEX/POSEIDON, JASON-1, ENVISAT, and JASON-2 during 1992–2015 show time-varying trends with respect to displacement over time in California’s San Joaquin Valley and central Taiwan, possibly related to changes in land use, climatic conditions (drought) and regulatory measures affecting groundwater use. Near Hanford, California, subsidence rates reach 18 cm yr with a cumulative subsidence of 206 cm, which potentially could adversely affect operations of the planned California High-Speed Rail. The maximum subsidence rate in central Taiwan is 8 cm yr. Radar altimetry also reveals time-varying subsidence in the North China Plain consistent with the declines of groundwater storage and existing water infrastructure detected by the Gravity Recovery and Climate Experiment (GRACE) satellites, with rates reaching 20 cm yr and cumulative subsidence as much as 155 cm.